Located on a tropical jungle hillside and featuring 4 styles of accommodations: clay pool cottages, tent villas, tree houses and bird’s-nest villas, the accommodations and public spaces are designed around the site’s unique topographic surroundings. The design focus is on the concepts of “life” and “village” and attempts to provide a simple and peaceful environment, with a touch of modern design. By taking advantage of the existing topography and the surrounding nature, the location is kept as much as possible in its natural tropical rainforest condition. The resort’s layout is designed to be a “valley village” but one that provides privacy with an exceptional zoning arrangement for each unit. The interior design, in both the public and living areas, is focused on blending characteristics representing the concept’s relationships and unity. However, the full and exceptional functionality of each area is of primary concern. In addition to the local tropical rainforest flora, non-jungle plantings are mostly of food plants such as fruits, vegetables and local herbs growing in an organic natural scheme. 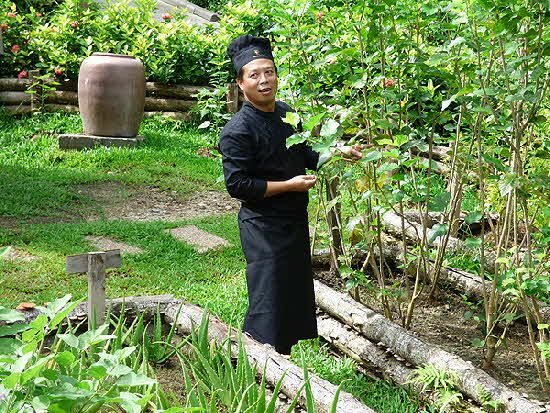 The product of these man-made gardens is widely used in the hotel’s kitchen, especially the herbs of the chef’s garden located near the entrance of the complex and so are the denizens of the chicken and duck coops and the product of the salad planters and the mushroom shed. General Manager Conor O’Leary welcomed us and made sure that all our creature comforts were well taken care of. 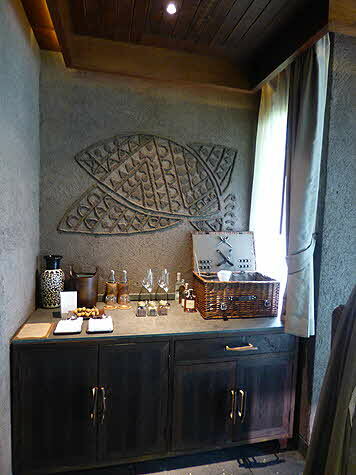 The suites are built in small groups of 2 to 4 units around four basic design ideas. Each suit is created in 3 levels; only a single or two steps up or down from a central entry hall with the bedroom at a lower level and the indoor/outdoor bathroom at a higher level. An exterior bubbling pool is outside every unit, next to the entrance or around a verandah. Each suite has a private terrace. The suites are all air-conditioned and sport King or Hollywood twin beds and the entire resort offers free Wi-Fi throughout the property. 16 Clay Pool Cottages - In this type of suite, the large interior is made of clay and soil, the furniture are made of wood and other natural materials. Unique spiral patterns are imprinted throughout to tell a tale of art and culture with a strong bond to earth and nature. 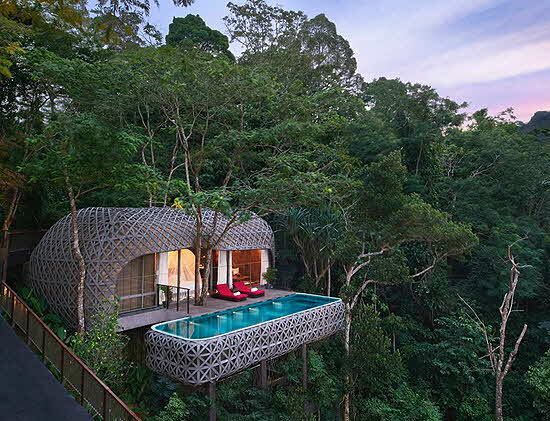 7 Tree Pool Houses - People love to live in high places and even in mid-air. The interior design reflects this belief and hanging furniture, set in unique patterns, are found in this type of suite. 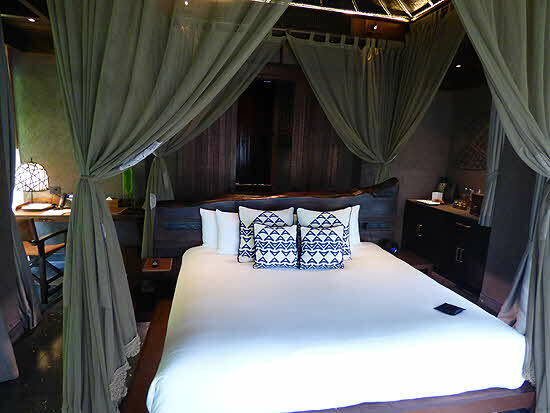 7 Tent Pool Villas - It is thought that a number of guests are wanderers and travelers. This inspired a design of canvasses that reflect ease of mobility and nomadic instincts. Each has a pool and outdoor lounging space. 8 Bird’s Nest Pool Villas - The guests using the villas prefer a luxurious lifestyle. The interior design of the villas reflects this belief by introducing a multi-color beautifully appointed design. My suite was in a Clay Pool Cottage complex; two suites sharing a walkway half-a-dozen steps down from the main road surrounding the resort and encircled by rainforest vegetation. There are electric golf carts that seem to be continuously driven around the resort so, most times, one can hitch a ride on one of them. Of course, if you need to be at a specific place at a specific time, you can always call the reception to send a cart. The communal areas that include the lobby, pool, two restaurants, conference space and the Mala spa are created to offer magnificent views of a lush forest surrounded by the sounds of nature. Throughout the resort there are plenty of outdoor spaces with natural features including, the chef’s garden, waterfalls and a rope bridge. 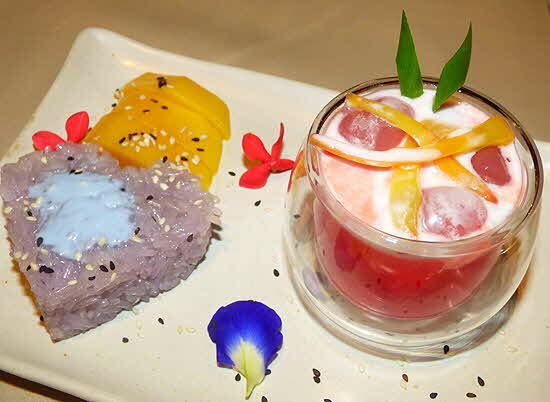 The two restaurants are helmed by executive chef Poonsak Srimuang. 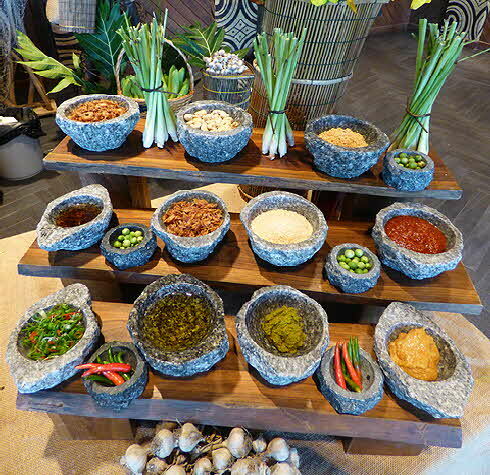 The cooking is classic Thai, with some dishes showing French, Indian and Malay influences. Much of the vegetable components of each dish are sourced right from the property’s gardens and salad planters. There is also a good-sized mushroom farm on-site that provides to the kitchen cultured oyster mushrooms. I don’t really know what the use of two water buffaloes that lounge near the waterfall is, but they provide visual continuity for the resort’s “village farm” concept. And, of course, the chicken coop provides eggs and meat to the kitchen as well. 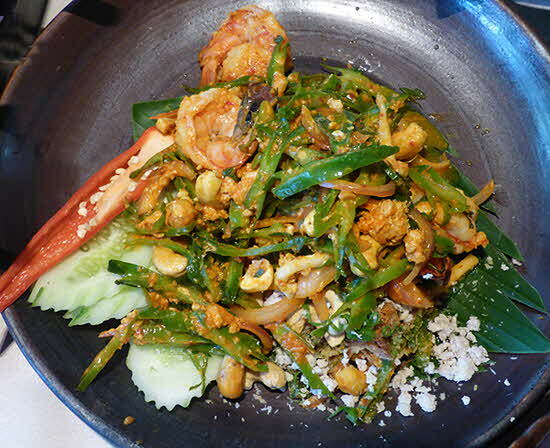 Thai cooking is highly aromatic and dominated by such ingredients as lemongrass, kaffirlime, scallions, garlic, bird’s eye chili, various mushrooms, fish sauce, tamarind sauce, coriander, cardamom and galangal - a member of the ginger family. Jasmine rice is served with most of the dishes and is usually flavored by the dinners with sauces from the curries -- there are 6 curry paste varieties in Thai cooking: red, yellow, green, sour, massamun and phanang. Coconut milk and coconut cream are used in very large quantities, as the soups and curries that comprise many of the dishes have coconut milk as a main ingredient. Chef Poonsak was kind enough to invite us to a Thai cooking class where we learned how to make a number of dishes including Tom Kha Gai soup (my favorite Thai chicken soup), a large shrimp and chicken dish, a fish dish, and sticky rice with coconut cream as a dessert. We then sat down and devoured the delicious results of our training.